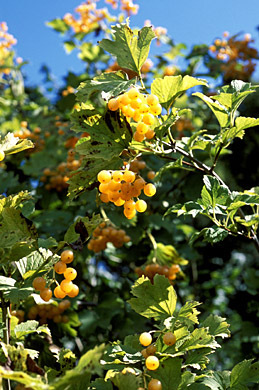 The Guelder Rose is one of the national symbols of Ukraine, featured in folklore, songs and art. It is also commonly referred to as crampbark, a most fitting title considering its wide use medicinally in the prevention of uterine spasms. Aside from this, it is an attractive deciduous or evergreen shrub that succeeds well in sunny, moist and well drained soil although it can tolerate most soil types reasonably well. It attracts a wide range of 'flying' insects - bees and beneficial hover wasps in particular and is a worthy candidate for hedging or low maintenance wildlife gardens. To order this plant please contact us balkanecologyproject@gmail.com. Deciduous Shrub growing to 5m x 5m at a medium rate. It is in flower in June- July, seeds ripen in Sept - Oct. The flowers are hermaphrodite (have both male and female organs). It can grow in semi-shade (light woodland) or full sun. Attractive maple liked lobed leaves that turn pink or red in the autumn.